The Best Thailand Youtube Channels from thousands of Thailand Youtube Channels in our index using search and social metrics. Subscribe to these youtubers because they are actively working to educate, inspire, and empower their audience with frequent updates and high-quality videos. About Youtuber Live Love Thailand aim is to is to share our updated experience with you and be helpful as much as we can, to your future trips to Thailand and other destinations. About Youtuber Inspire is the place to find out what's on in Pattaya, Bangkok and other regions in Thailand. About Youtuber Welcome to our Channel, Our Life Thai. Our aim is to both inform and entertain. You'll learn about the Thai lifestyle, food, culture, marriage, travel, being early retired and our shared passion for golf. About Youtuber Thailand Rob is from the USA and is living in Kamala beach Phuket capturing video of what it's like to see Thailand through fresh eyes and a camera. This channel is about what it's like in Thailand for a new guy who doesn't know anything about Thailand but is learning one day at a time. About Youtuber Destination Thailand looks at Thailand from an expats viewpoint, people who have make Thailand their home. About Youtuber RK Thai Kitchen & Beyond focuses on authentic Thai food flavors. About Youtuber I'm Godfree Roberts. I live and work in Thailand and I've been coming here since 1967. I've written three books about retiring in Thailand and helped hundreds of folks get settled here painlessly and quickly. This channel is about medical and dental care, shopping, Thai culture, house-hunting in Thailand, and – of course – making money in Thailand. About Youtuber Hi! My name is Pai, and I'm here to demystify Thai cuisine with easy-to-follow, authentic recipes uploaded every week. If you've ever been intimidated or hesitant to cook Thai food, that's what I'm here for! Not only do I show you how to make a delicious Thai dishes, I also explain why we do what we do, and give you tips and tricks to make sure you're successful. About Youtuber Kev-In-Thailand is about living in Pattaya Thailand and filming what it is like living here, Showing the life and places around Pattaya, Everything that is available here as an expat and as a tourist, I am hoping this channel is fun and informational to its viewers. About Youtuber Hi, my name is Siri Vichianchay. and I am the creator of Spoon Fork Heart, a cooking and recipe show with a focus on Thai food and Asian cuisine in general. About Youtuber Dr.David Channel is all about tours in Thailand, you'll see everything from Hotels, Resorts, Theme Parks, Water Parks, Tours in islands And suggested tours and markets. About Youtuber L'Officiel isn't just a magazine about Fashion; we live, breathe, and thrive on it. About Youtuber Expats In Thailand channel, we'll share our own journey and experiences of living in the Land of Smiles. You will discover an ever-growing collection of videos, resources, and reports all with one laser-focused purpose in mind to answer your questions about living in Thailand. About Youtuber Welcome to Thailand Ric on tour, my new video diary of my experiences exploring the culture and experiences on my travels in beautiful Thailand. About Youtuber Phuket Word is an Esoteric news and views containing Thai culture, lifestyles, Buddhism and the nightlife scene. About Youtuber Follow us to keep up with the latest updates on Thailand from Jeremy Clodfelter. About Youtuber I'm Big Fat Besty and welcome to my youtube channel. If you're coming to visit the kingdom of Thailand soon then this channel is for you! I'll be showing you around parts of Bangkok and lots of Pattaya so you can get a feel of the country before you visit. About Youtuber Presenting Thai street food from all over Thailand from the Northern provinces to the deep South. Covering many of the night food markets around Bangkok and outlying cities, including many tourist areas. About Youtuber Follow us to keep up with videos on Thailand from Thailand Noobie. About Youtuber Hello Thailand is about daily life in Thailand through an expat's eyes. About Youtuber This channel is dedicated to street food video compilations of Thailand street food and of the many interesting places to visit. Including the food markets throughout Bangkok and many of the provincial cities. About Youtuber Fun4Emily in Thailand contains everything fun, family, travel and many pieces of information about Thailand. About Youtuber Tales From Thailand gives you a description of Thailand. About Youtuber Looking through the Eyes of a Thai person for Foreigners to learn and understand Thai cultures and way of life when come to visit or come to live here. About Youtuber Follow us to keep up with the latest updates on Thailand from Real Life, Rural Thailand. About Youtuber Find the perfect property to fill your real estate desires. From houses, villas, condos, townhomes and even land, our website meets all of your needs. About Youtuber Food and Travel in Thailand is about Chiang Mai in the north of Thailand. Here you can see a video of real Thai food and how it is prepared. Furthermore, we take you on our travels in Thailand. About Youtuber Welcome to Pi Joel, I'm Joel, teacher, Muay Thai fighter and student of the Thai language and culture. About Youtuber Follow us to keep up with articles on Thailand from Tommy Freediver Thailand. About Youtuber It's better in Thailand is about living in Thailand. It contains a few epic adventures, the odd bizarre story, and some travel tips which were picked up on the way. About Youtuber Thailand channel should hopefully give you ideas of what to see and enjoy in Thailand. About Youtuber Speak Thai Possible with Naam is created to promote Thai language and Thai culture to anyone who is interested. I would like to create fun learning materials for Thai learners and hope that you enjoy my channel as much as I enjoy doing it. About Youtuber Thailand Travel Explorer is a collection of Short Clips and Photo Anthologies of my trips throughout Thailand! About Youtuber Learn Thai The Easiest Way With Me on Bo Siripa Aruenpong channel. About Youtuber Thailand Visual Guide is an emerging travel website. The information is shown in a wide range of short videos, through which we show the essence of this country. About Youtuber Thailand from the sky is about a video from the sky and it's nice to see and discover Thailand with a new viewpoint. About Youtuber Tourism Thailand helps you discover beautiful beaches, spas, fine dining, shopping, diverse culture and more Thailand videos. About Youtuber Thailand Tatler presents the best of Thailand and beyond through a highly entertaining editorial mix that includes personality profiles, glamorous parties, lavish fashion shoots, and authoritative articles that span the gamut of luxury lifestyle trends, from art collecting to wine appreciation, and from motoring to travel. About Youtuber Thailand Johnny Jay describes the experiences in Thailand. Follow us to keep up with the latest updates. About Youtuber Show-hey Thailand helps you explore Bangkok holidays and discover the best time and places to visit. About Youtuber Fishing in Thailand is about fishing in Thailand,DIY lure, fishing and travel. About Youtuber All about Thailand will give you description entirely on Thailand. About Youtuber Thailand Guide Channel contains the culture, natural beauty, food, mountains, temples, sea, and the beautiful beaches. About Youtuber Follow us to keep up with the latest updates on Thailand from Thai Travel News. About Youtuber LUXURY SOCIETY ASIA where the members can find latest luxury news, trends, what's hot, what's happening from Luxury Cars, Luxury Lifestyle Products, Brand names, Luxury Real Estate, Luxury Living, Luxury Fashion, Luxury Watches, Jewelry, and lots more. CONGRATULATIONS to every youtuber that has made this Top Thailand Youtube Channels list! 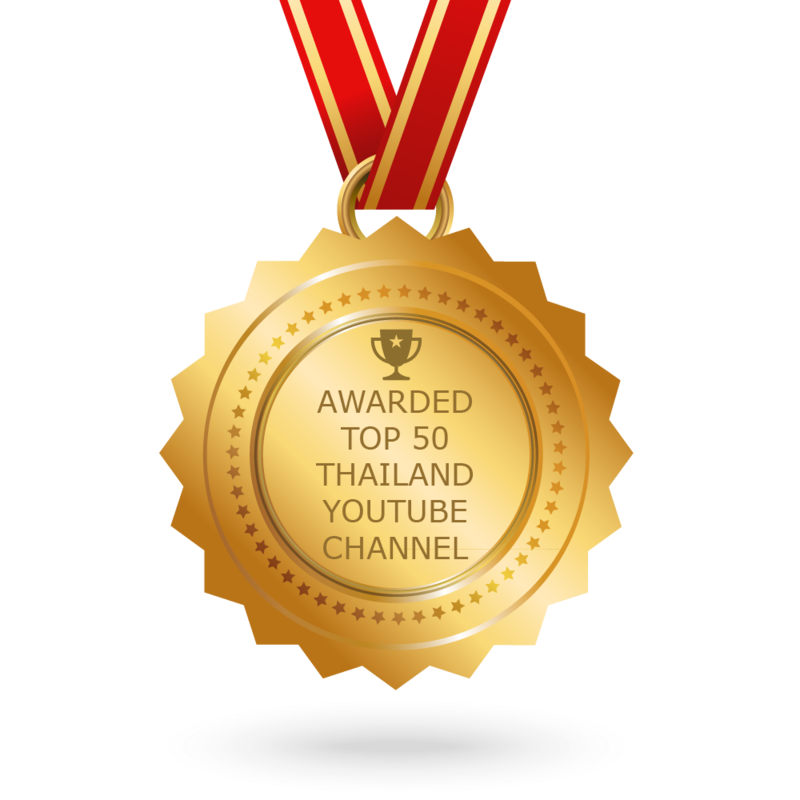 This is the most comprehensive list of best Thailand Youtube Channels on the internet and I’m honoured to have you as part of this! I personally give you a high-five and want to thank you for your contribution to this world.